Louisa Glenn D'Antignac, Gala co-chair, Brenda Nease, honorary Gala chair, Rand Glenn Hagen, Gala co-chair, and Lou Glenn, Gala co-chair. 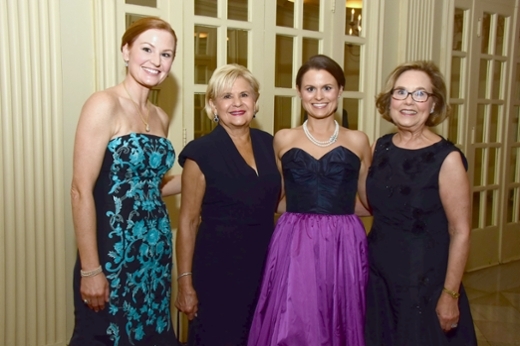 The fourth Winship Cancer Institute Gala is being called the most successful fundraising event in Emory University's history, raising more than $1.3 million dollars. The proceeds will benefit cancer research at Winship. "We are grateful for all of the generous donors who made this event a tremendous success," says Walter J. Curran, Jr., MD, executive director of Winship. "We are especially appreciative of our hard working Gala chairs: Lou Glenn, Louisa Glenn D'Antignac and Rand Glenn Hagen as well as our honorary chair, Brenda Nease."